Authentic Oxygen Tank Lamp | OhGizmo! I’ve always been a fan of furniture and such that is made from other everyday objects. These are the sorts of things that make others pause for a moment when entering your house. Take this oxygen tank that has been converted into a lamp. You can bet that any smoker is going to think twice before lighting up next to this. 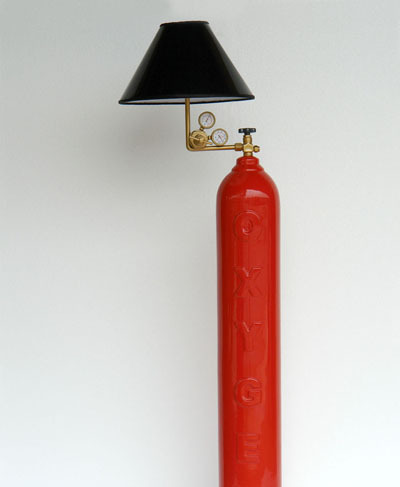 This lamp is made out of an actual oxygen tank, though despite the authentic gauges and valves, it no longer holds anything. Whether you’re going for that industrial look, or just want to go for that science theme for your apartment, this lamp will definitely fit right in. You’ll need to contact the artist for a price if you want one of your own. It's the wrong color, O2 tanks are green. They don't have “OXYGEN” printed down the side in big friendly letters either. Also, the regulator is glued onto the pipe in a completely non-functional way, it could have been attached convincingly if they had drilled out the valve for the wires to pass through.